Mixers are used toâ€¦errrâ€¦.mix. Those we use in the building trade are often are referred to (usually by civilians) as "cement mixers" but they don't really mix cement, per se. 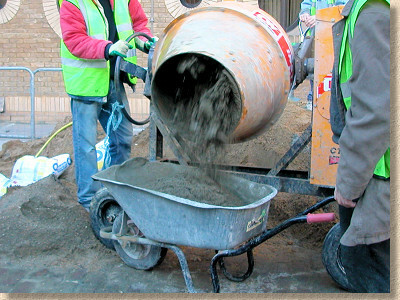 They most commonly mix mortar and/or concrete, both of which normally contain cement. In fact, they can be used to mix more-or-less any aggregates, whether that's with other aggregates, such as, say, sand, gravel and cement to make a concrete, or aggregate with a liquid binder, such as, say, pre-coated fine aggregate with a chemical activator to create a slurry resin mortar. Tumble type mixers (aka Gravity Mixers) work by rotating a drum containing the materials to be mixed and then allowing gravity to cause a tumbling effect which distributes the materials more evenly throughout the whole. Most of these mixers will incorporate paddles on the inside of the drum which lift the materials during rotation and then drop them to improve the tumbling/agitation action. Forced action mixers (aka Pan Mixers) rely on the paddles rotating, and possibly spinning, inside a fixed drum â€“ the material is forced rather than simply tumbled. Silos and some Mix-On-Site delivery wagons (Volumetric Mixers) will often rely on a screw-mixer, where the materials to be mixed are propelled along a rotating screw, often agitated by integral paddles. Paddle mixers or stirrers are simply a basic paddle attachment that is inserted into a drum or bucket or other container holding the materials to be mixed. For residential paving and hard-landscaping contractors, the most popular mixer is the mini-mixer. These typically have a drum capacity of 120-180 litres which enables a mix volume of around 80-100 litres (0.08-0.1m³). In layman's terms, roughly two or three 25kg bags of sand can be mixed into mortar in each drumload, which is roughly two-thirds of a barrow load. The drum is rotated by means of a mounted electric motor (240v and 110v models are available) or via a frame-mounted petrol engine which turns a belt or chain to drive the drum. Petrol-engined models are best for sites where access to power could be a problem; electric motor models tend to be cheaper to buy. Most models are wheeled, allowing them to be easily transported and, on flat sites, for the mixer to be pushed to a position where the mixed material can be emptied out as and when required. Many of the electric models, and some of the petrol models, can be mounted on a trestle stand which elevates the mixer to height which enables it to be emptied directly into a wheelbarrow. More commonly used on bigger projects where larger volumes of mortar or concrete will be required. Drum volume will typically be 200-400 litres which enables a mix volume of 100-225 litres (0.1-0.225m³) which would be around a barrowful for the smaller models and a couple of barrows for the bigger beasts. Site mixer discharging bedding mortar The drum is typically mounted within a chassis and rotated by means of an electric motor or petrol/diesel engine. The drum rotates while in an angled-upwards position and is rotated to an angled-downwards position to empty the contents when mixed. Although many models will have wheels to facilitate moving the mixer into a suitable position on site, they tend not to be moved about like the mini-mixers, relying instead on the mixed material to be transported via barrows, buckets or hods to where needed. These tend to be sturdier and more resilient than the smaller mini-mixers, but are considerably larger and more awkward to transport. They can be a good investment for contractors working on larger sites or commercial projects, but they are quite often hired-in when required. 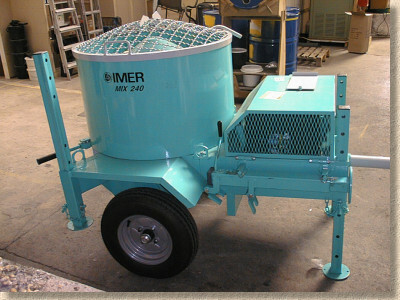 This form of mixer is more popular for preparation of non-cementitious materials. It is commonly used to give superior results when working with 'sticky' materials which might not be completely and evenly distributed by the action of a tumble mixer. This is why they are often recommended for use with resin bound aggregates, as well as some screed/grouting materials, as well as plaster. While it can be used for cementitious materials (most of the concrete flag and block manufacturing plants rely on pan mixers) it is not commonly used on site for preparing cement mortars or concretes. There is quite a range of drum sizes from 75-80 litres up to 400 litres and even bigger. The mixing action is achieved by means of paddles, stirrers and/or scrapers which are rotated within a fixed drum, forcing their way through the materials and thereby ensuring a thorough mix of all the material, not just the stuff near the centre which isn't clinging to the sides of the drum. As should be expected, there are models powered by electric motors and models running on petrol or diesel engines. The electric models are often used on larger sites and fixed locations while the engined models are better suited to mobile installation teams. 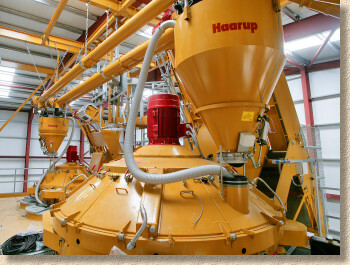 The mixed material is usually discharged via a sliding floor panel into buckets or barrows as needed, while some models (such as that shown in the video below) are simply tipped up to empty..
We've seen that tumble mixers work by rotating an inclined drum and forced action mixers work by churning paddles through the materials. The third method of mixing is almost a combination of the two: Screw Mixing. In essence, the materials being mixed are transported along a screw mechanism with integral paddles or blades, which further agitate the materials. So, the screw mechanism is partly an intense tumbling action while the blades are a forced action. On well-designed systems, a highly effective and thorough mix can be achieved in a relatively short period. 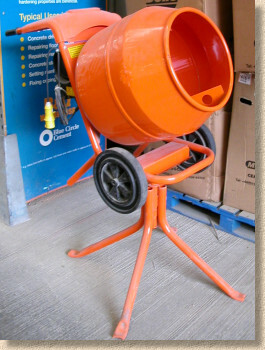 The most commonly encountered mixer which relies on a screw mechanism is the familiar 'concrete wagon'. The large, conical drum contains a spiral screw blade with paddles which rotates towards the front of the wagon when in the mixing phase, but is reversed to rotate towards the rear when the contents need to be discharged. Silos are becoming ever more popular for projects where larger volumes of a consistent, reliable mortar or bedding concrete are required. 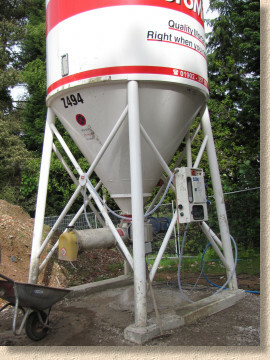 The basic principle is that the dry ingredients are held within the silo where there is no chance of the cement becoming hydrated, and are discharged on demand, often along a screw mechanism, which incorporates are pre-set volume of water to produce mortar or concrete of the desired slump. This is very similar, in principle, to the way mix-on-site concrete wagons operate â€“ the dry ingredients are held in containers and discharged via a screw mechanism which adds water at a specific rate to produce the mortar/concrete on demand. Mortar Silo For silos, the dry ingredients are usually pre-mixed at the factory, so the contractor has the opportunity to dictate precisely what type of mix is required, say a 4:1 mix of grit sand with cement which is popular for bedding paving, or a 3:1 fine sand jointing mortar. Once the silo has been filled, there is very difficult to 'tweak' the mix (other than slump), so if it's suddenly decided that a 8:1 mix would be more appropriate than the 4:1 mix in the silo, there's not a lot can be done. Mix-on-site wagons (Volumetric Mixers) do have a degree more flexibility as the dry ingredients (sand, gravel and cement) tend to be stored in separate compartments on the wagon, and so the quantity or proportion of each can be varied to suit the customer's requirements. The same wagon can churn out, say, a 75mm slump C20 mix for foundations and then switch to a semi-dry C7.5 mix for laying edging kerbs without needing to return to the plant. While silos can (and do) produce consistent mortar and concrete to a specified performance, the output from mix-on-site wagons can be a bit more variable. The very best wagons with all the latest computer-driven gadgetry (such as that shown above) can be very good, but some of the older kit will often work on a you-get-what-you're-given basis. These are basically a gate paddle which is inserted into material contained within a bucket or similar and rotated at speed to agitate and stir. 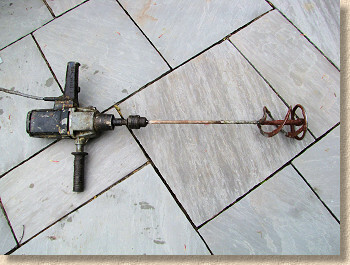 There are basic drill-attachment paddles which, as the name suggests, are simply mounted into a standard electric drill, and there are dedicated paddle mixer tools which tend to have beefier motors capable of providing a more nuanced service. They are, almost without exception, driven by electric motors so access to a power supply is essential. Their efficacy is highly dependent on the efforts of the operative. The paddle needs to be directed into the deepest corners of the mixing bucket, ensuring every grain or aggregate or drop of liquid is brought into the mix. A popular choice for resin jointing mortars and some cementitious grouts, they really aren't powerful enough for preparing concrete or larger volumes of mortar. 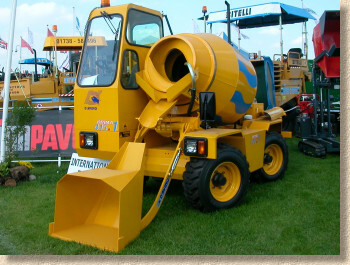 There are a whole multitude of mixers used in the construction industry and this page can't possibly cover all the options, but has attempted to look at those most commonly used in the paving, drainage and hard-landscaping trades. There are mixers out there that have highly specialised uses, and mixers that are used on mega-projects where large volumes are required. 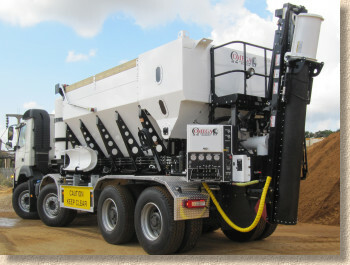 For pre-cast concrete production, large volume pan mixers are often located that the top of the production plant and rely on gravity to feed their output to the various machines that will shape and mould and press the concrete into blocks and flags and kerbs and so many other construction materials. There are even attachments that can be fitted to the front of loading shovels or excavators, powered by hydraulics or a PTO from the machine's engine. In short, there is almost no limit to the way that materials can be mechanically mixed for use in the paving trade, and that has to be a good thing!